One of the great culinary finds for me here in Sarasota has been palm fronds. It turns out that they make excellent fuel for the Webber grill. Of course, the price is right, and availability is no problem. I rarely need to forage farther than the street where I live to find an adequate supply. Once cut to size, the ribs and bases of the palmetto ignite with a piece of crumpled newspaper, and they burn at a very high temperature. I’ve found one drawback, and that’s predictability. It seems some palm fronds burn faster than others. So I’ve remedied that by adding a half-dozen hardwood charcoal briquettes to the fire. For grilling meats, the smokiness is great. I find it as distinctive as hickory or maple. But I’ve found another characteristic of palmetto that is unparalleled in my previous experience: it’s superb fuel for roasting bell peppers. I’ve had problems in the past with either all hardwood briquettes, or with various other types of wood, where the peppers’ skins would simply fuse with the flesh. In five batches of peppers of varying size and thickness now, the charred skin peels off quickly and easily. In fact, for me anyway, palmetto has given new life to an Italian classic. Roasted peppers are a staple of the southern Italian antipasto platter we all know, but they also make a terrific addition to sandwiches such as a panino prosciutto and mozzarella. Tony restaurants have recently been featuring roasted peppers in soups with tomato and basil. 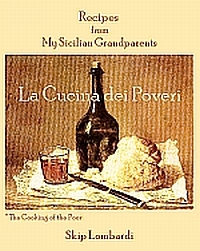 Roasted peppers are also the sine qua non for a dish of Pasta alla Napoletana. Roasting peppers is not rocket science. 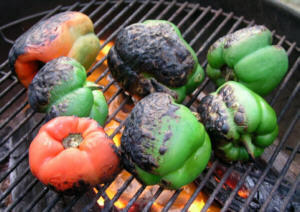 You need only a charcoal grill or a broiler to roast peppers. Then it’s just a matter of shepherding them though the process. This is a time, though, to give complete attention to the task at hand. One moment too long on the grill yields pepper-flavored charcoal. 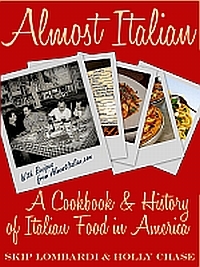 So let the phone ring through to voicemail, and free yourself from other potential distractions for several minutes, and you’ll be rewarded with one of the great treats of the Italian table. 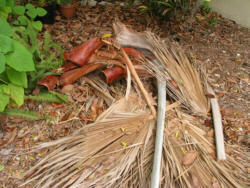 Notes:If you’re using palm fronds, use the ribs and base only. Cut the top, leafy part away, and bring it to the curb on yard waste day. In the recipe that follows, I’ve simply made reference to a charcoal fire. Of course this will work with all charcoal, or under the broiler in your kitchen too. Start a fire in a charcoal grill, or pre-heat the broiler. When the fire is ready, add the peppers without crowding them. Allow them to char on the side facing the fire, inspecting them from time to time. When the skin has blackened and has begun to bubble away from the flesh, turn them to expose another uncooked surface to the fire. Continue cooking them in this manner until they are uniformly blackened all around, then, stand them on end to blacken them top and bottom. As each pepper is done, remove it to a paper bag to rest. When the last pepper is done and added to the bag, seal the top by folding it over several times, and allow the cooked peppers to rest for fifteen minutes. For peeling the peppers, I observe a tradition I learned from my grandfather: I open a newspaper and simply rub the skins off onto the sports section. You could do it over a sink or a wastebasket, but do it in a place where you can control where the skins go. In his later years, my grandfather was also notorious for getting charred pepper skins all over the kitchen cabinets. If you find a particularly tough piece of skin that won’t come off easily, try loosening it with the back of a paring knife; failing that, try a vegetable peeler. When the peppers are peeled, cut off their tops, then remove and discard the seeds and pod. Cut the peppers lengthwise into strips about one inch wide and place in a glass or ceramic bowl. Add the garlic, capers, and anchovies. Toss to combine the ingredients, then add enough olive oil to coat the peppers. Don’t soak them; just coat them with the oil. Taste for salt and pepper, and add them to your taste. Leave the peppers to marinate at room temperature for two hours. If you’re not going to use the peppers immediately, cover the bowl with plastic wrap, or transfer to a glass jar and store them in the refrigerator. The peppers will keep, refrigerated, for at least a week. The peppers will be adequate as a component of an antipasto for twelve, or make sandwiches for six. But if there’s a good ball game on television and you have a loaf of good Italian bread and you’re all alone…well, all bets are off. How Do Things Get This Far?